Several people answer the appeal made by the children to accept Jesus. Guests of all ages entered the Montgomery, Alabama, United States Hispanic Church on Wednesday, December 20, 2017. They were greeted by members of the church’s Adventurer club, tiny hands stretching out offering handshakes and hugs. Guests were then directed into the sanctuary, where they stepped onto a road that had been constructed from black plastic and yellow tape. The road ran the length of the aisle, up the stairs and onto the stage, where it ultimately rose even higher and stopped at a hand-painted cardboard cutout of Jesus. Attendees at the service were placed on a road that led to Jesus. To open the service, four young people grabbed microphones and sang children’s songs with background tracks and Spanish lyrics on the screen. After a few songs, including a final opener where the crowd of about 60 people was invited to stand, Eliel Lopez offered the opening prayer. Lopez, a young church member, continued leading the service by making a few announcements and going through a series of questions and offering prizes to those who would answer correctly. The questions were about the different presentations that had been given each night since the series began the previous Saturday. Most of the children in attendance had their hands raised high, ready to try to answer the prize-winning inquiries. This series was the result of Rodriguez and the church board recognizing the number of young people in their church and making an effort to include them in such an important church meeting. The Montgomery Hispanic Church holds several adult evangelistic events every year but had never assembled an event specifically geared toward children, by children. The church became involved immediately; adult members donated their time and resources to create the stage decorations and large backdrop. Parents were intentional about bringing their children to practice and attended each meeting. It also allowed for an excellent opportunity to involve the church’s Adventurer club in every aspect of the series. Rodriguez and other adults noted how the presenters mimicked the preaching styles and mannerisms of adult preachers that have preached at their church before. It was apparent that these children had been listening to the sermons for quite some time and were able to repeat the styles they’ve seen. 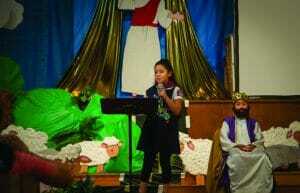 Chi even opened her sermon with a personal story about her father to help capture the attention of the audience. While the series was primarily targeted toward children, the adults who brought them stayed, listened, and could be heard offering an affirming “Amen!” to Chi’s presentation. At the conclusion of her sermon, Chi made an appeal, and several young people, along with a few adults, stood at the front while a closing song played. After a short time, Chi joined the group and gave a closing prayer. Rodriguez believes children have an edge. “The kids have enjoyed leading out, and they aren’t afraid to make appeals that could change someone’s life,” he said. An original version of this story was published in Southern Tidings.